With enhanced security enabled, files and folders in privileged locations allow internet access even if Trust Manager is set to “Block all.” Also, cross domain access always requires specifically trusting those domains as a privileged location in the Enhanced Security panel–simply trusting those sites in the Trust Manager will not work. Choose Change Settings in the Internet Access… panel. 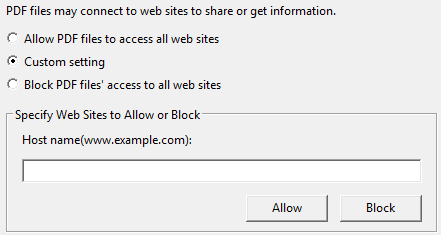 Choose whether to allow, block, or create custom settings for PDF access to web sites. If you choose the custom settings option, the Web Sites panel becomes active and you can enter unique URLs. URLs must begin with www and end with a valid suffix. The Acrobat family of products maintains a white and black list of URLs called the Trust List. Users can specify whether or not URL access is allowed on a global or per-URL basis. For URLs that aren’t explicitly trusted or blocked (they are not on the white or black list), a warning appears whenever a document tries to access the Internet. When you check Remember my action for this site, the site is added to your URL white or black list. Legacy multimedia: Any multimedia content which uses 3rd party multimedia plug-ins for playing content is legacy multimedia. The Yellow Message Bar appears on playing the legacy multimedia. Default supported multimedia: Any multimedia content which uses the Authplay.dll for playing content is defined as non-legacy multimedia. Files like .flv and h.264 encoded files play by default. The Yellow Message Bar doesn’t appear in the presence of these media types. Choose Preferences > Multimedia Trust (legacy). Check or uncheck Allow multimedia operations. Always: The player is used without prompting. Never: Prevents the player from being used. Prompt: Prompts the user to enable the player when a media clip tries to use that player. Allow playback in floating window with no title bars: Opens the media in a separate window without a title bar. Allow document to set title text in a floating-playback window: Opens the media in a separate window with a title bar. Allow playback in full-screen window: Opens the media in full-screen mode. Membership on the trusted document list is permanent until the list is manually cleared. Choose Clear to remove all documents from that list. Never On No XObject access; proxy displays, if any. Never Off No XObject access; proxy displays, if any. Always On (w/ privileged location set) XObject displays. 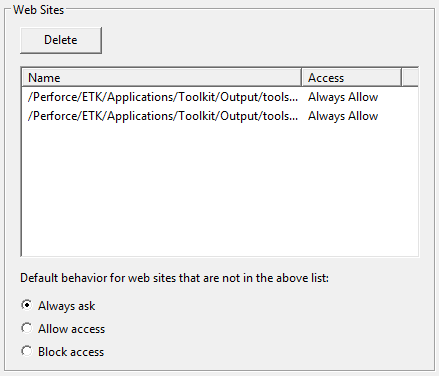 Always Off No XObject access; proxy displays, if any. Choose Preferences > Page Display. Set the location of referenced files (if any). Disable or enable 3D content. Lock the setting so users cannot change it. If it is trusted, the 3D content renders. If it is not trusted, a Yellow Message Bar appears which states that the file might pose pose a security risk. The Options button provides options for trusting once or always. Trusting the document for always adds the file to the privileged locations list and sets a registry entry under \TrustManager\cTrustedFolders\cTrustedFor3D. Acrobat DC products do not use Flash in any part of the product. Embedded Flash content may play in a PDF if that feature is not disabled; however, that capability is likely to be disabled in 2018. Adobe Reader and Acrobat stopped shipping with a dedicated Flash player in version 9.5.1, . Since then, rendering Flash content in a PDF requires that a Flash Player already reside on users machine. This strategy simplifies Acrobat and Reader deployments by reducing the number of future required updates should a security issue arise. Control whether Flash plays within PDFs by setting the bEnableFlash registry entry (Win) or EnableFlash plist entry (Mac). When bEnableFlash = 0, Flash content is rendered as an empty, white box and does not play. A yellow message bar also appears at the top of the document stating that “Some features are disabled to avoid potential security risks.” When bEnableFlash = 1, Flash plays if there is a system player present. If a player is not found, then the user is prompted to download the latest version. A file residing in a privileged location cannot override this preference. With the March, 2018 release, it is possible to block PDF actions which result in following and opening links in a PDF. For details, see the Preference Reference.